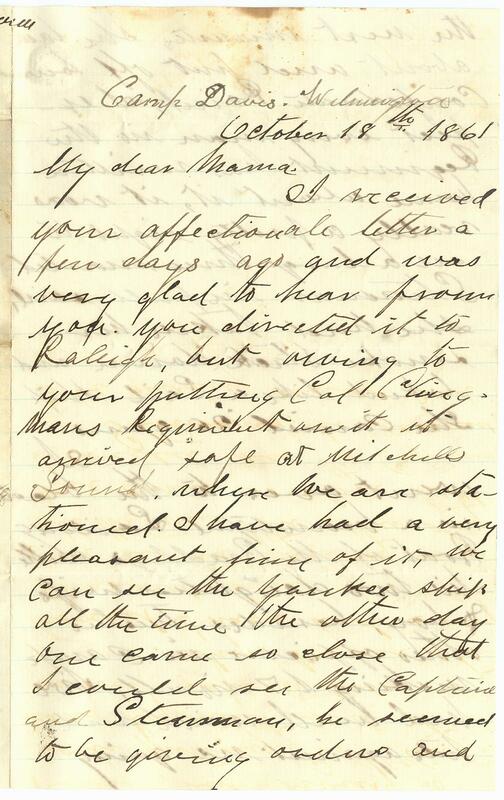 Item description: Letter, 18 October 1861, from William Cain, 25th North Carolina Infantry Regiment (while stationed at Camp Davis in Wilmington, N.C.), to his mother. Item citation: From folder 12 of the John Lancaster Bailey Papers #39, Southern Historical Collection, The Wilson Library, University of North Carolina at Chapel Hill. I received your affectionate letter a few days ago and was very glad to hear from you. you directed it to Raleigh, but owing to your putting Col. Clingmans Regiment on it it arrived safe at Mitchells Sound, where we are stationed. I have had a very pleasant time of it, we can see the Yankee ships all the time. the other day one came so close that I could see the Captain and [Steerman? 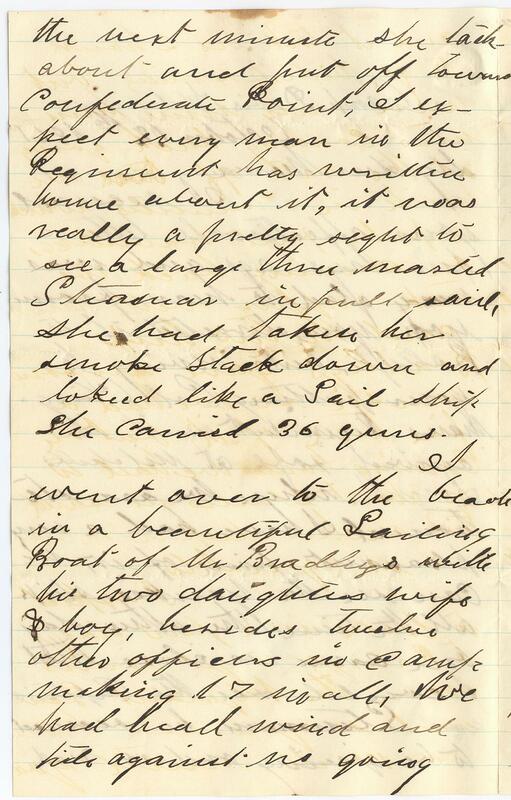 ], he seemed to be giving orders and the next minute she took about and put off toward Confederate Point, I expect every man in the Regiment has written home about it, it was really a pretty sight to see a large three masted Steamer in full sail, she had taken her smoke stack down and looked like a sail ship she carried 36 guns. 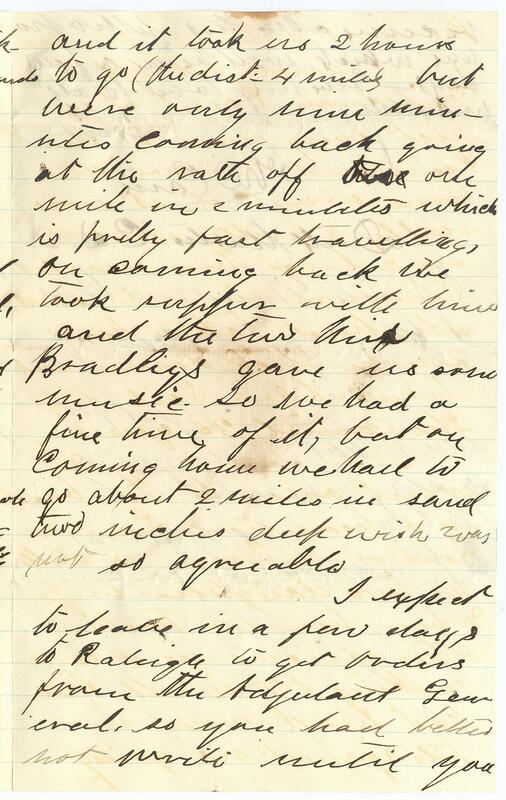 I went over to the beach in a beautiful sailing boat of Mr. Bradley’s with his two daughters wife & boy, besides twelve other officers in camp making 17 in all, we had head wind and tide against us going and it took us 2 hours to go (the dist. 4 miles but were only nine minutes coming back going at the rate off one mile in 2 minutes which is pretty fast travelling, on coming back we took supper with [?] Miss Bradleys gave us some music, so we had a fine time of it, but on coming home we had to go about 2 miles in sand two inches deep wich was not so agreeable. P.S. Tell Grandma that I have just received her letter. I have just got news that I am going to stay a month more with the Regiment, to direct to Camp Davis. 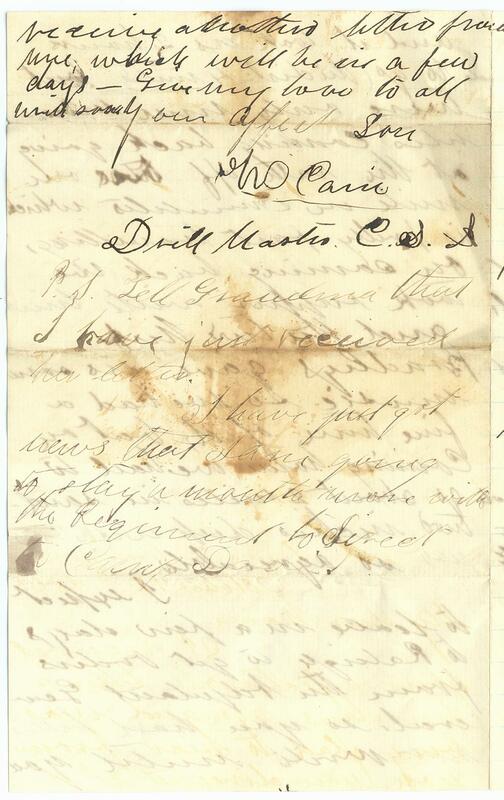 This entry was posted in Southern Historical Collection and tagged 25th North Carolina Infantry Regiment, Camp Davis, Thomas Lanier Clingman, William Cain, Wilmington. Bookmark the permalink.